Comfort Intense Vaporesse Fresh Sky Ironing Water 1L is the secret to easy ironing, helping you glide effortlessly over creases for smooth clothes that hang better. Gives ironed clothes an uplifting fragrance. Anti-static formula helps clothes feel more comfortable to wear. Just pour it straight in your iron?s water reservoir to fragrance and smooth your wonderfully soft clothes. Helps to protect your iron by removing limescale. Use in combination with Comfort Intense Fabric Conditioner. 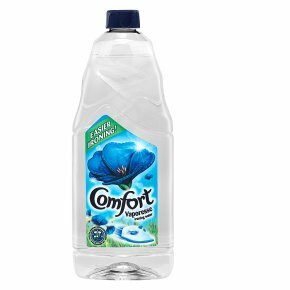 Comfort Intense Vaporesse Fresh Sky Ironing Water 1L makes ironing more enjoyable, and even protects your iron by preventing limescale. Used in your iron instead of normal water, Comfort Intense Vaporesse helps you effortlessly glide over creases for easy ironing and smooth clothes that hang better. What?s more, it brings a delightful fresh-air fragrance to your ironing. How to use: 1. Using Comfort Ironing Water is easy: simply pour it directly into the water reservoir of your steam iron and you?re ready to go. First-time use: Before using Comfort ironing water for the first time, it?s important to descale your iron to avoid limescale deposits. Follow your iron manufacturer?s descaling instructions. Enjoy easier ironing thanks to an anti-static formula that helps reduce creases and makes your clothes more comfortable to wear. Use it on all of your ironing for uplifting fragrance and smooth clothes that look and feel great. With Comfort Intense Vaporesse Fresh Sky Ironing Water 1L in your cupboard, ironing will never be the same again. Pair it up with Comfort?s amazing range of fabric conditioners and open the door to a world of delightfully soft clothes and wonderful fragrance. Comfort Intense Fresh Sky is also available in fabric conditioner, tumble dryer sheets and perfume pearls. Use together for best results.